This reusable, crumb-trapping bib sports adjustable straps and the likeness of an affable otter. Trap errant crumbs and saucy splotches in their tracks with this soft, reusable, plastic-free bib... and the pair of eager little paws printed upon it. 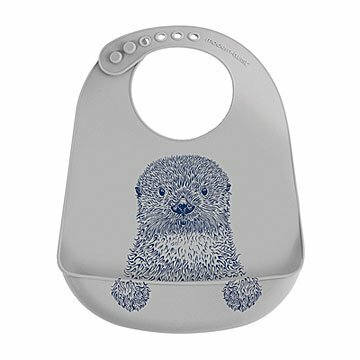 Shaped like a bucket to capture any edible cast-offs, this bib sports adjustable straps and the likeness of an affable otter, so kiddo can dine in comfort. Meanwhile, you'll be grinning, too: Sturdy silicone construction means no need to toss after a single use, and with fewer spills, you'll spend less time cleaning at meal's end. (That's what we call a "win-win.") Made in China. Bought this bib for my 10 month old granddaughter, who is on solid foods. It catches all her little messes; it is easy to clean, and it is cute! Easy to put on and take off.